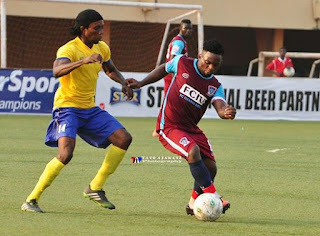 FC Ifeanyi Ubah midfielder, Tamen Medrano By JOHN PAUL NNAMDI FC Ifeanyi Ubah’s Cameroonian import, Tamen Medrano, is confident his side will maintain their supremacy over Rangers as they prepare for Sunday’s Oriental Derby, at the FC IfeanyiUbah Stadium, Nnewi. The Anambra Warriors host Rangers International in a match day 6 clash and Medrano has no doubt his side will triumph. “Although we are yet to attain our best form, we are battle ready for the Derby against Rangers. “I understand the nature of this Derby and I believe my teammates equally know what is at stake. We have quality players and we will prove that on Sunday”, he said to naijaleague.com.ng. FC Ifeanyi Ubah is yet to lose to Rangers in back-to-back matches at the Super Four and the Charity Cup. In two matches at home, the Nnewi side have claimed maximum points from Rangers. Sunday’s Oriental Derby will be their third meeting in three months.